“…taking the listener Everywhere and Nowhere”. The title is a phrase that is lifted from Scott McLoughlin’s sleeve notes. It has caught the eye of several writers, and has indeed claimed the attention of Michael Quinn who has placed a review of the three sonatas in The Journal of Music in Ireland which “has gained a reputation as a lively magazine for musical insight and debate, comprising first rate contributors, intelligent but accessible writing”. Mr Quinn’s C.V. reveals a huge range of skills and expertise. He writes for many magazines, is an editor, publisher, producer, chairman, director, radio drama producer … and more. I have read this review several times and will continue to read it, not only for the content, but for the pleasure it gives me to read such cogent, quality prose from a person who obviously is a master of his craft. Two C.D’s. are reviewed in parallel in this piece. Mr. Quinn artfully interweaves his discussion between the two. 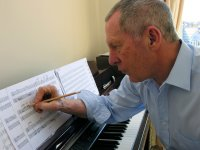 One, of course is the sonatas, the other a recently-released album of contemporary piano music by seven Irish composers. And who is the pianist? Cannot be anyone other than the magnificent Mary Dullea. In one of the pieces she vocalises – watch out Lady Gaga there’s a new kid on the block. The thread that runs throughout the review(s) concerns composers who explore the boundaries of the piano “illustrating the instrument’s capacity for accommodating both full frontal assaults and guerilla-like incursions” His opening line refers to Ferrucio Busoni’s dictum that “everything is possible on the piano even when it seems impossible to you, or really is so”. Many of his comments, his insights, reach deep into my composer’s psyche… “while he posits himself in opposition to the past and seeks to differentiate and distance his music from the present, the sonatas’ restive references to the extremes of Wagner, Sorabji, Tippett and various points in between betray the confinements of both”. The level of his prose continues as he aims his sights on Sonata No. 8 … “he plays with the unsettling notion of identities fractured and refracted out of recognition, globules of sound time and again coalescing into near-definition only to disperse before they can be recognised and fixed …a virtual archipelago of shifting motivic landmasses washed repeatedly by shifting, waveforms and the flotsam and jetsam of drifting harmonies”. These extracts are why I am sure that you, the reader, will turn to the full review and delight, revel, in Mr. Quinn’s wonderful exercising of the written word. His closing paragraph echoes and fleshes out his introduction. “… both discs find composers revelling in the intricate warp and weft of music in which defining threads are intentionally ravelled, deliberately obfuscated or omitted altogether … suggest a developing shift away from the boundaries of a composer’s imagination to the limits of a performer’s technical abilities offering up the alluring prospect that what seemed impossible or really is so on an instrument as venerable and venerated as the piano might actually become possible.